Free Download Sprill Game or Get Full Unlimited Game Version! 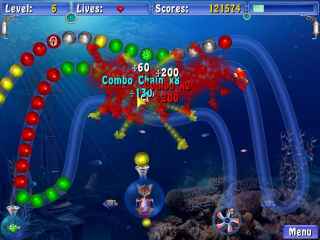 Strap into your mini-sub and plunge into the deepest waters of the bluest seas to help a hero named Sprill eliminate long chains of colored marbles! In order to get advantaged of playing Sprill full unlimiteg game version you must register the game. 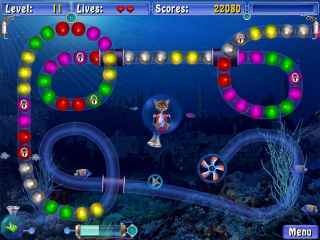 Strap into your mini-sub and plunge into the deepest waters of the bluest seas, where you'll help a charming hero named Sprill eliminate long chains of colored marbles! As the advancing strings roll through breathtaking tropical oceans, you'll be challenged to create matches of three or more marbles of the same color. Add spectacular graphics to the addictive gameplay, and it's no wonder Sprill is creating a splash among casual game fans everywhere! You'll have fun from beginning to end, helping Sprill find clues to discovering the secret of the Bermuda Triangle!